I'd say that I have absolutely no idea what's happened to the past seven weeks, but that would be a lie! A fractured wrist doesn't sound that serious or too much of an injury, but in all honesty it has been one of the hardest things to recover from that I've had to deal with. I was lucky to have the surgery and receive such brilliant after-care, but April has past by in a whirlwind of surgery, appointments and physiotherapy. Being unable to use both arms has been frustrating and there have been many tears. I have a completely different appreciation and more understanding now for the children in school with broken arms! The thought of trying to do this post properly is way too much to deal with! I know that I've taken a photo every day because, unable to crochet and do my daily row for my Sky Blanket, I've photographed the sky to record the colour and be able to play catch up at another time. What it does show is that actually the past seven weeks have been quite sunny and we've had some lovely blue skies. The first photo is from today, the last photo is from dawn on the day after I'd broken my wrist and was returning from hospital at 6am. 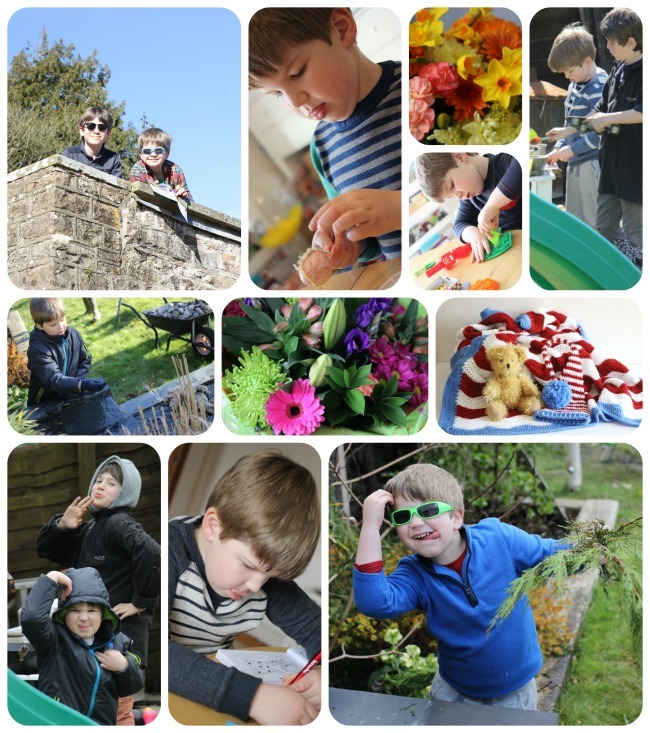 To add to the abundance of blue skies, I've also got a smattering of photos of normal life; flowers from friends, days out from before my accident and play in the garden or crafting with The Boy. I can't wait to get back to normality! They are very beautiful pics and the collage of all the sky pics looks so good. So glad your wrist is so much better now, it's come on leaps and bounds in a short while! Nice to have you back, and a great way to catch us up. Nice to see the blossom coming out on the trees. Intrigued by the castle in amongst the trees. Hope you are well on the way to recovery. I'm amazed by how blue the sky has been over the last few weeks – it hasn't always felt that way. Fingers crossed you're back to normality soon! It sounds like it's been a horrendous few weeks. I'm impressed that you've kept up with taking your sky photos the whole time and also impressed with how blue it has been. I'm sure our sky hasn't been that blue. Lovely photos of the Boy. Look forward to reading your posts regularly from now on. Welcome back, sorry to hear you have been out of action. I cannot imagine how difficult breaking an arm would be – how did you do it? Wow, the skies are amazing – nice to have lots of blue for a change. Glad to hear the wrist's a lot better. So nice to have you back! Your pics show that it has actually been really nice weather! Love the photos of the sky – what a beautiful way to capture spring. I'm so impressed that you managed to take photos one handed (I normally drop my phone doing that!). I broke my writing arm in high school and it was a shock to realize how much you need two hands for things. The only good thing was that I learned to become basically ambidextrous in those six weeks, so hopefully you end up with some new talents too!